CamilleCooks includes its history of chilled soups. I’ve always enjoyed making them (in a blender!) and eating them (cool!). The latest Ottolenghi Simple cookbook, by Yotam Ottolenghi, includes his recipe for “Chilled Cucumber, Cauliflower, and Ginger Soup” (which he first published in The Guardian in July 2015). Pour 3 1/3 cups of water into a medium saucepan and add the fresh mint, the sliced ginger and 2 tsp. of salt. Bring to a boil, add the cauliflower and blanch for 2-3 minutes, until just cooked but still retaining a bite. Drain and set aside; discard the mint and ginger. Put the cucumbers in a blender or food processor with the grated ginger, garlic, yogurt, lemon juice, 1 tsp. salt and 1/2 tsp. of white pepper. Blitz smooth, then chill for at least an hour. Heat the oil in a small saucepan on medium heat and add the almonds. Cook for 3-4 minutes, stirring often, until the nuts are a light golden-brown. Transfer to a bowl, stir in the dried mint. Add a pinch of salt and set aside to cool. 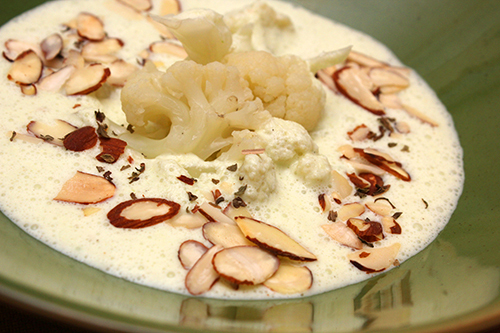 When ready to serve, divide the cauliflower florets between four bowls and pour the cold soup on top. Spoon the almond mix on top and serve. The “cauliflower blanching” process is fragrant, thanks to the mint and ginger in the pot. Make sure you first weigh your ginger (3 1/4 oz. ), before you add two-thirds of that amount to your blender with the cucumbers. Too much ginger will make your soup too spicy. I like how the cool yogurt and cool cucumbers offset the spicy ginger. And the toasted almonds add yet another layer of interest, crunchy and minted. The next recipe I’ll try from Ottolenghi Simple is the “Spinach and Feta-Stuffed Baked Potatoes” (recipe below). Come back next week to see how it goes. Poke the potatoes a few times with a fork and then place them on a parchment-lined baking sheet. Bake for 1 hour or just over, until the flesh is soft all the way through. Remove from the oven and slice the potatoes in half, lengthwise. Scoop the flesh out into a medium bowl, setting the skins aside on the sheet for later. Roughly mash the potato with 1 1/2 Tbsp. butter, the cream, feta, 3/4 tsp. salt, and a generous grind of pepper and set aside. Take the remaining 3/4 Tbsp. butter and divide it among the potato cavities. Sprinkle with a generous pinch of salt and return to the oven for 8 minutes, for the skin to become crisp. Remove from the oven and set aside. Place a medium saucepan, halfway filled with salted water, over high heat. Once boiling, add the spinach for about 10-15 seconds, just to wilt. Drain the spinach, squeezing out as much of the water as possible. Stir into the potato flesh, to combine, then spoon the mash back inside the empty skins, piled high. Bake for 15 minutes, until the top of the mash is crisp and browned. Remove from the oven, sprinkle with the walnuts, and serve.